I was diagnosed in December 2010 with Fibromyalgia. My symptoms appeared quite suddenly in the summer of 2010. It started with strange burning/ aching pains in my hands that rapidly progressed to my feet and thighs. For the next few months the pains came and went but I stopped any physical activities that I had previously enjoyed, even walking the dog for 10 minutes daily stopped. 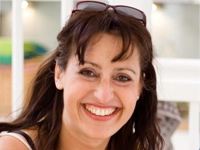 I had been seeing a therapist, Louise Levy, for general anxiety issues, for which I had received hypnotherapy and counselling and she suggested I read the mind body prescription, which I did and I then, with Louise’s help, completed the SIRPA programme. Louise also used her skill as a hypnotherapist to enhance the programme so every week at the end of our session I was hypnotised to reinforce what we had discussed in the session. I found this really useful. Within 2 weeks of starting the programme my pains had virtually disappeared. I learnt to understand that my pains were a distraction and that I needed to acknowledge that and address the real issues. I found visualization and being strict with my goals beneficial. I now know what I need to do to keep my mind and body healthy and accept that I will need to keep working at it, maybe not for ever but for now. I have a bag of ‘tools’ and I can dip in whenever I choose to. The support of Louise has been invaluable, her calm positive attitude has spurred me on especially when at times I have wobbled. I have learnt to be kinder to myself and accept that I cannot change other people but I can change my reaction to them. The programme gave me a structure to follow and a wealth of experience to learn from.